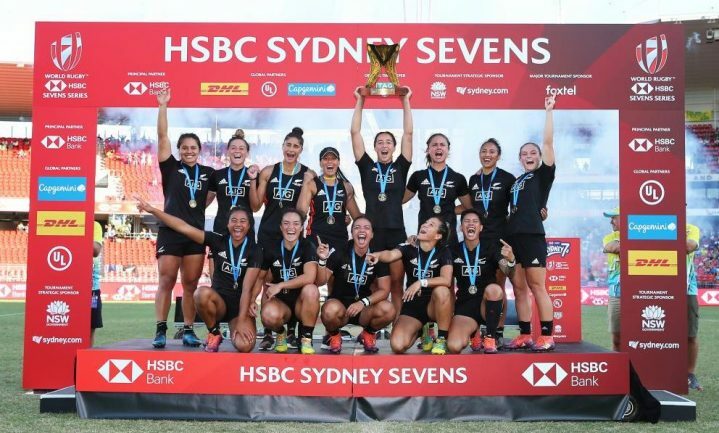 New Zealand have won six tournaments in a row for the second time in HSBC World Rugby Women’s Sevens Series history after a Michaela Blyde hat-trick inspired them to a 34-10 defeat of hosts Australia in the HSBC Sydney Sevens 2019 final at Spotless Stadium on Sunday. Twelve months ago New Zealand had left Sydney licking their wounds after they were whitewashed 31-0 by Australia in the final, a defeat that proved the catalyst for their dominance since which has seen them claim six Cup titles on the series, an historic Commonwealth Games gold medal and complete a successful defence of their Rugby World Cup Sevens crown. The Black Ferns Sevens are now one win shy of equalling their record of 37 victories in a row on the series that they set across 2014 and 2015 and have won 49 matches in all competitions since that painful defeat. The 14th Cup final between the two most successful teams in women’s sevens history was their first meeting of the HSBC World Rugby Women’s Sevens Series 2019. The outcome, though, would be the same as their last encounter, in the title decider of the HSBC Paris Sevens last year – a New Zealand victory. Stacey Waaka opened the scoring for the Black Ferns Sevens and then turned try-saver when she tackled Evania Pelite into touch as the Australian looked certain to tie the scores. The try did ultimately come for Australia after some great play by Emma Sykes, the play-maker left with little option but to try the kick ahead and she ran through to gather it with ease and dot down. Australia suffered a blow, though, when captain Sharni Williams was sin-binned for taking a player out in the air and New Zealand pounced with two quickfire tries to lead 17-5 at half-time, Shakira Baker capitalising on a missed tackle to score before Michaela Blyde sprinted clear for her first try. 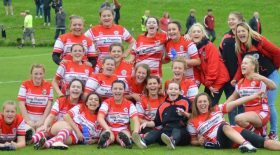 Blyde capitalised on three missed tackles to score again within a minute of the restart, but Sykes gave the home crowd hope when she stepped her way through the defence to cut the deficit to 24-10. Ellia Green then chased down Niall Williams to prevent another Black Ferns Sevens try but there was still time for HSBC Player of the Final Waaka to dot down and Blyde to complete her hat-trick for a ninth victory in 10 meetings with Australia. There was to be no fairy tale podium finish for Ireland after braces from Kris Thomas and Kristi Kirshe saw USA claim the bronze medal with a 26-10 victory. Thomas put the Women’s Sevens Eagles on the front foot when she scored with only 30 seconds on the clock and then Kirshe, playing in her first series tournament, spotted a gap in the Irish defence and exploited it to perfection. Thomas added her second for a 19-0 lead at half-time but Ireland responded with tries by Amee Leigh Murphy Crowe and a solo effort from Eve Higgins. Kirshe, though, put a stop to Ireland’s comeback with her second try after a nice one-two on halfway. Earlier in the day, New Zealand had gone into the semi-finals without their play-maker Tyla Nathan-Wong after she limped out of their previous match, but under the blazing Sydney sun they were in no mood to miss out on a seventh successive series Cup final. Their attacks were initially pushed backwards by the USA defence, but once Blyde got the ball in space on the wing there was only one outcome likely. Ruby Tui then bounced out of a tackle to run in a second with Gayle Broughton also crossing for a 19-0 lead at half-time. The Women’s Eagles Sevens, who beat New Zealand at this stage in Sydney in 2017, needed to score first in the second half but they put the restart out on the full and some strong running lines saw the Black Ferns cross twice more through Baker and Katarina Whata-Simpkins. There was time for a late consolation try for co-captain Lauren Doyle – her 50th on the series – but the win was New Zealand’s. The temperature was certainly more to Australia’s liking than Ireland’s in the second semi-finals and they hit the ground running with Green scoring two tries in little more than a minute to the delight of the crowd, one of them coming from a turnover by captain Williams with quick ball to Pelite for her to release the speedster. Green slipped as she looked set to race away for her hat-trick score but another try did come through Emma Tonegato for a 19-0 half-time advantage. The second half was a different story, though. Gone was the dominance from Australia as first-time Cup semi-finalists Ireland pressured them into errors and panic at times in defence, Murphy Crowe scored twice to spark hopes of a comeback and it took a big tackle from Green to stop a third try for Ireland. Australia put pressure on themselves again with a loose pass in front of their own posts, but Pelite again released Green to complete her hat-trick and secure a place in the final for the second year running in Sydney. Bianca Farella’s late try saw Canada come from behind to beat France 19-17 in the fifth place play-off, securing valuable points in the race for Olympic qualification. France had enjoyed a dream start when Shannon Izar dotted own in the opening minute, but Canada hit back when captain Ghislaine Landry’s deft kick was pounced on by Farella to give her side the lead. It didn’t last long, though, as France put Izar into space for her second try and a12-7 lead at half-time. Landry sidestepped through the French defence to tie the scores before uncharacteristically hitting the post with a conversion from in front of the posts, but once again Les Bleues’ response was swift as Valentine Lothoz and Carla Neisen combined well for the former to edge their side ahead again. That looked like being the winning try until Brittany Benn offloaded to Farella and she did the rest, Landry making no mistake with the conversion this time. “We worked really hard. You can’t turn off as the game of sevens is too good nowadays. To finish fifth is the best outcome we could have got at the start of day two and day three. For Olympic qualification, keeping close to the top three or four is our main goal for now,” said Farella. Russia also finished on a winning note, beating Spain 34-5 in the seventh place play-off. Beatriz Dominguez Sanchez had given Las Leonas the early lead, but Baizat Khamidova backed her pace and raced away to tie the scores. Kristina Seredina and Khamidova scored while Maria Losada was in the sin-bin for a high tackle and there was no way back for Spain as Anna Bystrova, Daria Noritsina and Daria Lushina got their name on the scoreboard as well. The fifth place semi-finals had earlier kicked off the final day of play at a sun-baked Spotless Stadium with Canada overcoming some early Russian pressure to take control of the match with Bianca Farella running in the opening try from halfway before Kaili Lukan dotted down on the stroke of half-time for a 12-0 advantage. Canada, needing to do some damage control to minimise points loss in the race for Tokyo 2020 Olympic Games qualification, gave Russia a way back in when they knocked on and Arina Bystrova pounced on the loose ball to run in unchallenged, but they held on for an important 12-5 victory. France enjoyed the perfect start in the next semi-final, Marjorie Mayans turning the ball over and Seraphine Okemba finishing off the move in the corner. However, she turned villain seconds later with a deliberate knockdown earning her a seat in the sin-bin, with Spain capitalising on their advantage with Patricia Garcia dotting down. Garcia then slalomed her way through the defence for her second try, but France hit back instantly after Mayans offloaded for Caroline Drouin to run in for a 12-12 tie at half-time. The match looked to be heading for extra-time until Anne-Cecile Ciofani found a way through the Spanish defence with 30 seconds remaining to seal a 19-12 win. The HSBC World Rugby Women’s Sevens Series continues with round four at the Mikuni World Stadium in Kitakyushu, Japan, on 20-21 April.